Perhaps one shouldn’t judge a collection on the sum of its smallest parts but damn, I like lipstick. And I really like this lipstick. Lancome’s French Touch Absolu is heavyweight, solid and beautifully designed to capture the attention of vintage-lipstick lovers everywhere. You should take note of how small this is. Possibly the one down-side to retaining that authentic, vintage styling. It’s practically a stub. A stub of beauty, but a stub nonetheless. For the princely sum of £23.50, you get 3.7ml (not listed in grams) of product (EDIT: Rouge Deluxe has come to the rescue and confirmed that you get 3g of product, the same as a MAC lipstick – so, erm, ignore me). It has a wonderful old-fashioned lipstick scent that evokes memories of playing with my Nan’s makeup when I was a little girl. It’s thoroughly charming and despite the obvious absence of any value for money… my heart has been captured. In 1945, Lancome redefined the codes of beauty by launching “Shaker”, its very first lipstick, in the ultimate shade of red. In creating the latest French Touch Absolu, Aaron de Mey has once again drawn inspiration from Lancome’s heritage whilst adding a modern twist. The sumptuous, creamy texture of French Touch Absolu guarantees a deliciously sensual velvet touch: a true silk cream enhanced with Pro-Xylane™ to give lips stunning contour and shape. One swipe. 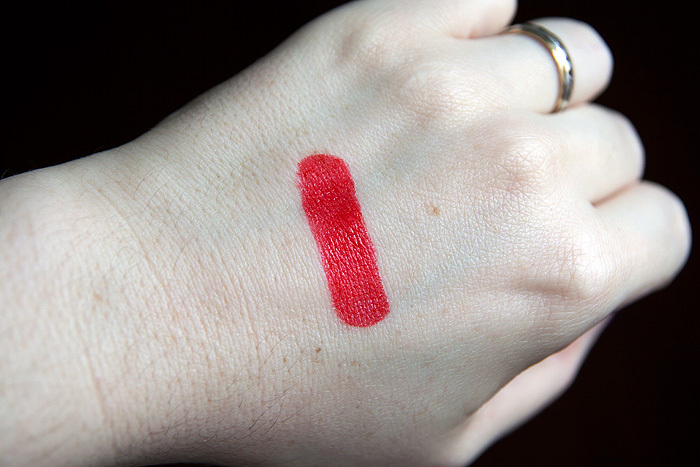 Perhaps there is a little more value for money there than I first anticipated… The above swatch shows shade #102 Rouge St Honore, but there will be two other reds available (#100 Rouge 29 and #104 Rouge Faubourg). Words can’t quite express how in love I am with this lipstick. I mean, I know the collection is all about that blush, which is of course ridiculously pretty. But I’m not just looking at it, I wanna use it and this lipstick would blow most products out of the water. It’s creamy without being heavy, moisturising without being slippy and once blotted, it stays put for hours. Love. Are you going to post a pic with it on your lips? I love the colour, I am after a perfect red but have cool colouring, with red cheeks, so its hard. This looks lovely, I don’t mind the small size, considering only once in my life have I ever reached the end of a lippie (cannot remember what that was now *sob*) although the hefty price of this may get me in trouble with the hubby. Who thinks my high end haul only cost me £50 for the lot, whoops! Can’t wait, once I get rid of my accidental tan I am a similar colour so look forward to that! Very pretty. May have to consider this as well. Oh boy your tempting the heck out of me. I’m such a sucker for a good red! Hahah my surname is Shaker.. I need to find that original lipstick!!! 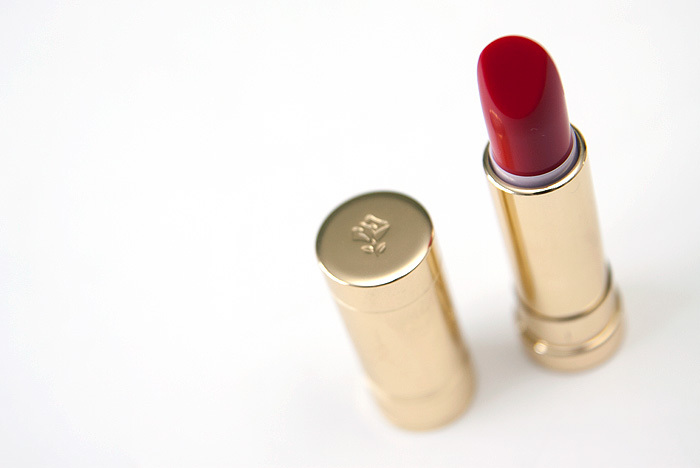 According to the box of my Rouge Faubourg, the lipstick is 3.7ml/ 3g/ 0.10oz. MAC lipsticks are also 3g, I think. Mine wasn’t sent boxed and is only listed in mls on the bottom of the tube but you’re quite right, it’s 3.7ml not 3.4 (not sure where I plucked that number from). That is beautiful, I can’t wait to see it on. >I live in Southern Africa and wanted to buy the Julie Hewett Bijou range’s Biba. However, I don’t think I can get my hands on it. Do you know any good (equally moist) alternatives in more regular brands like MAC, Estee Lauder, Clarins etc? My skin shade is just a tad bit tanner than yours.